It’s the final countdown! We have two teams leading into Thanksgiving week: Team Here for the Feast and Team Here for the Leftovers. Which one are you on? I am all for the first take on all of the Turkey Day classics, but if I had a choice between fresh-from-the-oven and day 2 (or let’s be honest here, days 3 through 6) leftovers, I am TEAM LEFTOVERS all day, baby. If there is one thing we do in abundance around here (other than pasta, takeout-fakeout and all things chocolate), it is creative takes on Thanksgiving leftovers. There is certainly no shortage of options from how to repurpose the bird, the stuffing, the cranberry sauce, and of course, the mashed potatoes. 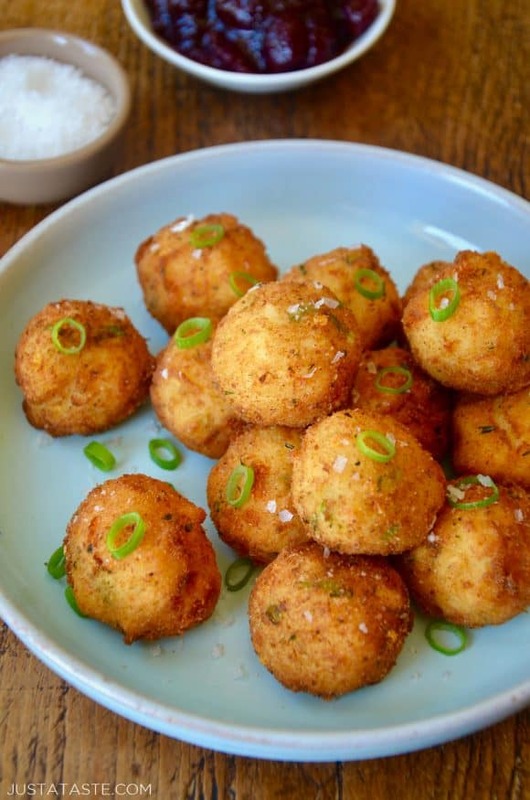 Leftover mashed potatoes are perhaps the easiest to transform into something super-special on day 2, and Leftover Mashed Potato Balls leave the door wide open for customization. I’ve kept it simple with cheese and scallions for mix-ins, but chopped leftover turkey would also be a welcome addition. Dip and dunk these pillowy potato balls in leftover gravy or cranberry sauce for a guaranteed post-Thanksgiving (or post-potato surplus!) party. Don’t miss more ways to repurpose Thanksgiving leftovers with recipes for Mashed Potato Pancakes, The Best Leftover Turkey Salad (seriously, read the reviews!) and Leftover Stuffing Waffles. 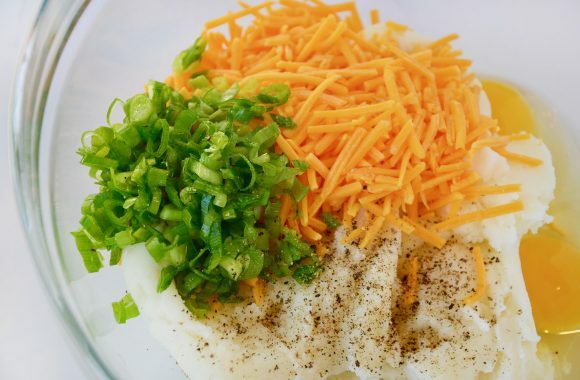 In a large bowl, stir together the mashed potatoes, scallions, cheese, eggs, and a pinch of salt and pepper until well combined. Place the breadcrumbs in a separate large bowl. 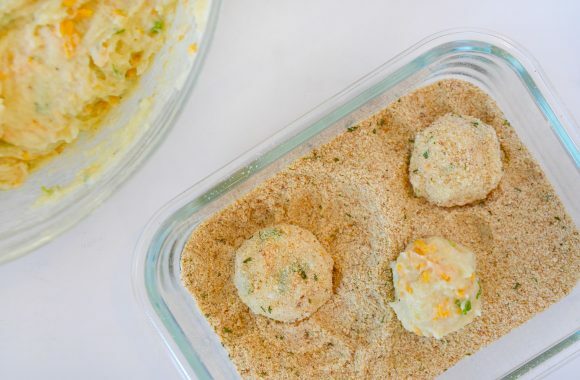 Scoop out about 3 tablespoons of the mashed potato mixture and roll it into a ball then roll the ball in the breadcrumbs. Repeat the rolling and breading process with the remaining mashed potato mixture. Line a baking sheet with paper towels. Add the vegetable oil to a large heavy-bottomed stockpot set over medium heat and attach the deep-fry thermometer. Once the oil reached 360°F, add a few of the mashed potato balls and cook them, turning occasionally, until they’re golden brown. Using a slotted spoon or colander, transfer the mashed potato balls to the paper towel-lined plate and immediately season them with salt. 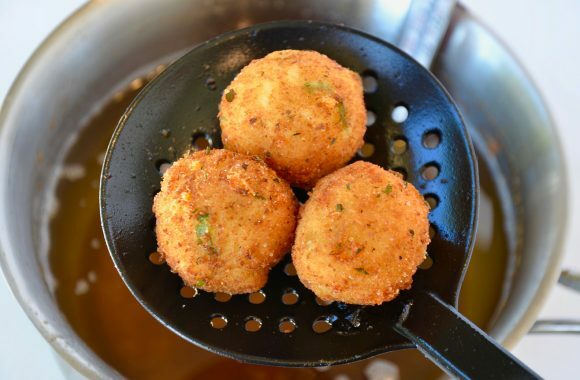 Add the remaining mashed potato balls to the oil, returning the oil to 360°F between each batch. 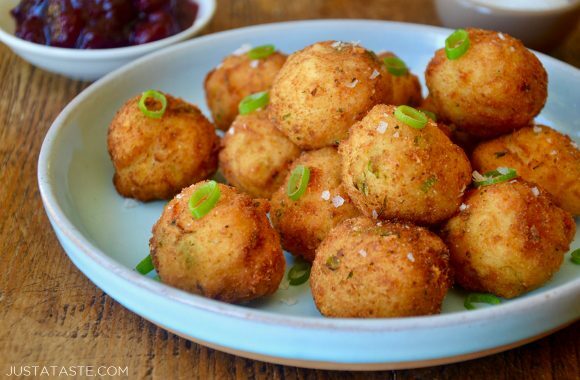 Serve the mashed potato balls with leftover cranberry sauce or gravy for dipping. Leftover mashed potatoes will vary in texture. If your mashed potatoes are thinner in consistency, add all-purpose flour until the mixture is cohesive.